Need emergency Ladera Ranch Bee Removal? The Bee Man specializes in bee removal. Since 1977, our technicians know how to pinpoint the location of hive buried in a wall and minimize the damage in removing the honeycomb. 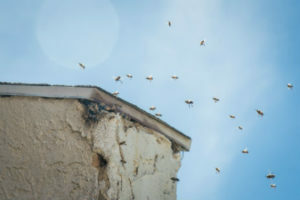 Beehives can cause a significant property damage if left untreated. Feral honeybees like to build their hives in protected areas where the temperature can be regulated. As a result, inside the wall structures between the framing is a great place for bees to build their home. Bees only need a small 1/8 to 1/4 inch opening to gain access to the inside of a wall, so building a hive in the wall becomes pretty easy for them. Once a hive is built, bees become very territorial and will protect it by sending out 100’s or 1000’s of bees to chase off intruders. Depending on the species of bee, this can be very dangerous if the hive is an Africanized honeybee. Known as “killer bees,” these bees are extremely aggressive when defending their hive. Beehives can cause significant property damage. First of all, large hives can weigh over 100 pounds. The sheer weight can put undue stress on the structure of the wall or any electrical wiring, pipes, etc. Hives will also ooze honey, wax, and bee waste which can seep into the wood or drywall. The odor associated with this seepage can attract unwanted guests such as cockroaches, ants, mice, rats, and even small animals including opossums. The best way to tell if there is a hive is by observing the flight pattern of the bees. If they appear to be darting in and out of a specific hole or location, chances are there is a hive. Consequently, that’s when calling The Bee Man to remove the hive becomes a priority. The Bee Man offers emergency Ladera Ranch bee removal services. Beehives are not the only infestation we treat. There are also issues with swarms. Rather than assess your own infestation, call The Bee Man for a quote. Above all, your safety is our concern, so please refer to our bee safety tips here. Finally, if you need any Ladera Ranch bee removal, please contact The Bee Man at (949) 455-0123 before any beehive you may have causes property damage.